In a bowl, add chicken cubes, chopped garlic, crushed pepper, salt, coriander leaves, lemon juice, 1 beaten egg , tomato sauce and mix well and marinate for half an hour. Take toothpicks and thread each with chicken cube, followed by cheese cube and then chicken cube. Roll them in the bread crumbs and then dip them in the remaining marinade and roll them again in the bread crumbs to double coat. 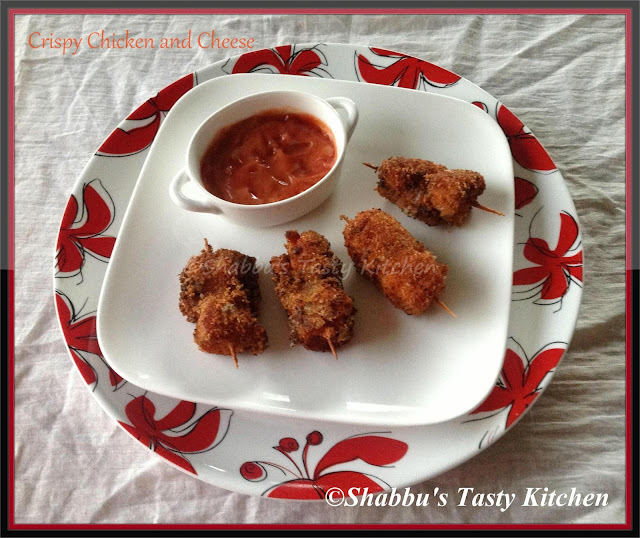 Wow...crispy n yummy cheesy chicken...looks inviting!